Robbie Metz throws a pitch earlier this season. Metz will look to lead the Colonials in the postseason. Before the season started, when the team was bearded and looking like men well beyond the drinking age, the Colonials talked about a gut feeling, a belief that they could end their season in Omaha at the College World Series. Come Wednesday at 10 a.m., GW will host the Atlantic 10 Championship at Tucker Field. The Colonials come in as the six-seed among seven teams after losing their final four conference series and falling to 13-10. They will first play No. 3 Richmond in a double elimination format. If GW loses the first game, they will play later that night at 8:30 p.m. Despite the low seed, GW has never seemed over its head in a game. They traveled to California for spring break and battled with top-tier talent and defeated then-No. 16 Maryland at College Park, 12-1, early in April. Though teams like Saint Louis may have more experience than the youth-laden Colonials, there’s a lot of parity in the tournament teams and the squad seems to buy into the belief that they have what it takes to win. GW played their first 10 games at home, going 7-3 for their best start since 1983, when Ritchie was a freshman on the Colonials squad. They played a majority of their games at home this season, including in-conference play. Hosting the A-10 Championship should act as an advantage. In conference play they went 10-5 at The Tuck. This could be explained by a telling statistic to GW’s success. The Colonials’ walk-to-strikeout ratio, at bat, and their strikeout-to-walk ratio, on the mound were much more significant when playing at home in conference than on the road. A 3:1 strikeout-to-walk ratio at home meant GW would score more than a run on average than their opponent. Similarly at the plate, if the Colonials walked at a 3:1 ratio to striking out, they would outscore their opponent by more than three runs. At home, GW not only has the advantage of playing to a field that they are familiarly with on defense, but they also enjoy hitting at The Tuck. The Colonials averaged two extra base hits per game in conference play at home, including six total home runs. Playing on their home turf won’t be enough to get the Colonials to their season goal, winning an A-10 Championship and heading to the NCAA tournament. Although predicated on strong and smart defense and team offense, GW will need a few players to come up particularly big. In a double elimination format, bullpens will be called on in short notice to stop any potential bleeding. One way the Colonials can avoid that is if their season’s top starter, junior Bobby LeWarne, who tallied a team-high eight wins, can go deep into the game. In his 13 starts, he is averaging just greater than six innings a game. On a good day when his changeup has late movement upward and he is locating his fastball, LeWarne could work through a lineup with limited pitches into the seventh inning. A big start from ‘Bobby the Bull’ could start GW on the right page. When the bullpen does come into play, GW will look for the backend to close out games. The Bullpen Bash Brothers, country hard-baller, redshirt senior Craig LeJeune and the nation’s saves leader, sophomore Eddie Muhl, almost always shut down a game. At the plate, aside from the well-executed bunts – including suicide squeezes – the Colonials will need timely hits. In their last three conference series, they have fallen short, unable to come up with a big hit with runners in scoring position. Perhaps the most important hitter for GW is their table-setter, sophomore Joey Bartosic. He batted a team-high .335 on the season and scored 36 runs, 15 percent of the Colonials total runs scored on the season. His speed is what kills: Bartosic recorded 19 stolen bases on the season. The Colonials average about four runs a game. For every stolen base Bartosic records, they average 1.5 more runs per game. If he doesn’t score in a game, GW will lose by 1.5 runs on average. While if he does score just one run, they will win by more than one run a game. If Bartosic scores two runs in a game, GW will win by four runs, on average. Needless to say, the Colonials need their lead-off man to execute in the playoffs. GW did not play Richmond this year, but they did face a similar Spiders roster last year and were swept on the road. And a lot of the key performers from last year were juniors to the chagrin of GW. This year, Richmond is led by senior Ryan Cook on the mound. 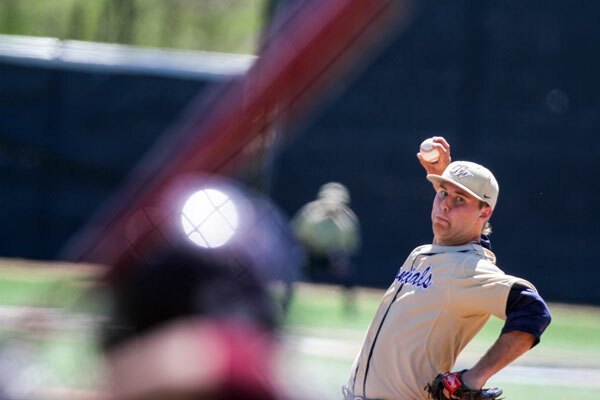 He beat the Colonials last year in seven innings, giving up one run on five scattered hits. This year he is 7-2 with a 2.92 era and is averaging just less than a strikeout per inning. At the plate, graduate student Michael Morman is the team’s top performer. He enters the tournament batting .388, with six home runs, 53 RBI and 50 runs scored. The Spiders also boast the A-10 top home run hitter, junior Matt Casey, who has 17 home runs, with a .308 batting average. This article appeared in the May 18, 2015 issue of the Hatchet.